Throw in a few berries, and Dot pretty much follows its lists of notes: bitter orange, leafy green accord, pepper, osmanthus, olibanum and white amber woods. It's juicy and berried / fruity for a few seconds, then it's terribly peppery but only for a brief time. Then there's sheer florals, a bit green but only vaguely osmanthus-y. While Dot has a definite fruity undertone, there's none of the rich apricot jam (or indeed, any richness at all) that you might hope to find in an osmanthus fragrance. There's light incense — for about 20 minutes mid-development, the incense is the strongest note, and that was my favorite part — and a pale woody amber-ish dry down. If you'd asked me to smell it blind and guess what it was meant to be, in a million years I would not have said osmanthus, or indeed any particular flower at all. It just smells like a light summery floral, mostly clean, entirely innocuous. Verdict: I said above that I wouldn't have guessed osmanthus, and I wouldn't have guessed Comme des Garçons either. The name Dot, I presume, comes from the many polka-dotted items, from shoes to wallets to shirts, in the brand's Play diffusion line. In stark contrast to the avant-garde fashions of Rei Kawakubo, most of the "casual basic" Play items look indistinguishable from the old-style preppy clothing from The Gap et al., and can be identified as Comme des Garçons only by the red heart face Play logo (or, sometimes, the red-heart polka dots). Dot, the perfume, works in something of the same way. 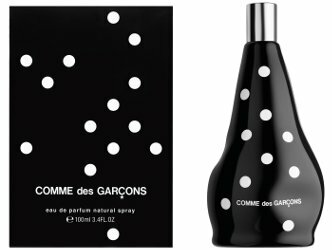 It's been some time since Comme des Garçons was widely perceived as an avant-garde perfume house, but still, Dot might be the most "accessible" / "casual basic" fragrance they've done yet,3 and if it were not for the incense, there would be nothing to distinguish Dot from any of the billionty other inoffensive light floral fragrances on the market. It's harder, I think, to signal irony in perfume than it is in fashion. Still, Dot is pleasant and easy to wear, and it's well done.4 It joins the ever-swelling population of fragrances that I would probably wear if a bottle fell in my lap, but even then I am not sure I'd reach for all that frequently. The quick poll: name 3 Comme des Garçons fragrances that you think anyone new to the brand should try. Comme des Garçons Dot was developed by perfumer Lucas Sieuzac. It is available in 100 ml Eau de Parfum, $130. 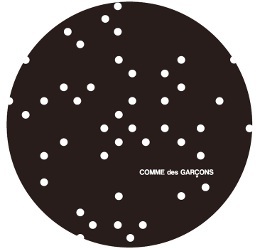 For buying information, see the listing for Comme des Garçons under Perfume Houses. 1. Comme des Garçons described it as a "rejected bottle". 2. Via Liberty of London. 3. You could also make an argument for 2009's Dover Street Market. That one skewed a little masculine, this one skews a little feminine. 4. This is where I make a guilty admission that I only wore Dot for two days before writing this review. Three is usually my minimum, and I'm happier with four or five. But I decided Dot was not going to reveal anything new on further wear, plus, Kevin could not get his review done for today. I promise I will wear it again this coming weekend and come back here to eat my words if it all comes out glorious in the end. For the rest, I am not as certain, probably something from the Leaves, Incense and Synthetic series. I wear Tea, Zagorsk + Kyoto, and Garage. And I have to admit that I *intended* to not expect much, but old habits die hard. Thanks for the comment about The Gap et al.! Odeur 53 has been the only one I’ve liked so far, although admittedly I haven’t tried very many. CH, do you like what was going on in fashion in the late 90s/early 2000? If so, and since you like Odeur 53, I would think that there is a good chance that you’ll like many others from the early series. I have been disappointed in CdG lately. Girl was a scrubber and Floriental was meh. I don’t think I’ll be going out of my way to sample Dot. As for three to try, I really like the original 1994 Comme des Garcons parfum and any of the Incense line, particularly Avignon and Kyoto. Me too. I’ve loved the Monocle scents, though, and the first Stephen Jones. If the upcoming Grace Coddington is a boring rosewater, I’ll be quite disappointed. We don’t get all that many cat bottles. Make the rec for me too! LOL – I’ve only ever tested Red. Which I liked. Oh, do try the incense series! I think they are worth trying even if you don’t love incense. I should – I need to do some incense discovery. Same here. I feel like I maybe missed the good era of CdG? Also true though that they just stood out more because there were so few “experimental” niche brands. I think they’ve gotten less experimental, but also now they have tons of competition. I got a lot of lemon on the opening ( which was probably the berry and bitter orange) and then screechy wood. It settled down on me to a less screechy wood, with the barest hint of fruitiness. More like a park bench with spilled Kool-Aid on it. Or the stick after you’ve finished your Orange-Berry Popsicle. But it’s a nice stick, made of decent quality wood. LOL! You liked it way less than I did. 1. DdG 3 is absolutely lovely and a fun and interesting take on rose. 2. Rhubarb is one of my fave summer evening scents. It is just wonderful and really has a true rhubarb note. Daphne is certainly love it or hate it, but it’s not innocuous! I have it easier: it was a NO from the first try. Yes, that is clearer! Haha! I love the Daphne scent as well – the only CdG fragrance I own. Ha, see what I said just above! I’d recommend the original CdG, at least one from the incense series, and the first Stephen Jones. I have a birthday later this month and Stephen Jones was the present I bought myself (which is how I ended up with a sample of Dot). At first I wasn’t sure what to make of SJ, then I loved it and had it on my to-buy list for a couple of years, and I think it’s one that epitomizes the wonderful weirdness of the brand—or at least the weirdness it used to have. Well, I would not claim Dot does not smell like osmanthus so much as it does not remind me of osmanthus as it is typically used in perfume, and certainly didn’t make me think of it! But I’m sure a better nose than I would recognize it — so you are probably right. Hmm, Original, Odeur 71, and the first Stephen Jones. (If Tar or Garage were still readily available I might pick one of them.) Nothing smells like those three and it gives a glimpse of the otherness of the original CdG aesthetic and an idea of the progression (before the move to an ordinariness that characterizes the newer releases) of that aesthetic. Tar and Garage were fun…that whole series was fun. Looooove Stephen Jones! I’d own it if it was maybe $100. The original crazy violet. I loved the “Sweet” collection and wish I’d bought all of them before they were discontinued. I also covet Stephen Jones (black bottle)… and Rose and Carnation are fun, too. I’d love to have the 1st Stephen Jones. Gorgeous bottle, too. Probably Avignon, Rhubarb, and Stephen Jones are as good as any. Something by Mark Buxton should probably be included as examples of the line’s earlier scents, such as 2 Man or the original Comme des Garçons, although that may be a bit alienating. CdG 2 Man was a great scent, and I almost never hear about it anymore. And Rhubarb was really before its time! I, like you Robin, give each CdG a chance because gosh-darn-it they were one of the original lines that got me all excited when I first got into fragrances. Well please do go smell it, don’t take my word for it! Barneys did not have Dot last week – hrrrrrmph, although it sounds like I probably could go through life not having smelled it and won’t feel like I missed out! Some CdG perfumes I think others should try include: Series Red – Carnation, Series Incense Kyoto and Stephen Jones Wisteria Hysteria. I should try that Carnation again — have you smelled it lately? So many carnations have been ruined by IFRA. I have a bottle and I could have worn it for last week’s challenge. I like it, including its bubblegum note, BUT 4 sprays last all of 30 minutes on me. Rhubarb has been on my buy list for awhile, and it’s quite a bargain! It is! And love the cute white bottles. I actually think the most intriguing of the incense range is Ouarzazate which was my first niche purchase To me it really captures that avantgarde/couture nexus! And it’s the only one of the series I own! I wouldn’t mind owning Kyoto, though, and would probably buy it if it came in a smaller size. SNAP! I don’t find Ouarz that easy to wear, but every time I sniff it I’m impressed by its verve. CdG was my into to niche perfumes and I have a huge soft spot for the line, although they frequently disappoint me. I love the original edt, and CdG 2 gives a close look at the artistry of the brand by combining weird stuff and having it smell great. For more on that theme, go for Odor 53, or to my favorite, the Incense Series, where I would suggest Kyoto. I have a huge soft spot too. Really hope they do another Monocle, I like what they’ve done with those. I love the Monocle ones too but they wear like colognes. If they were priced as such I’d back then wholeheartedly. Well, it’s true I’ve never bought one. If CdG followed Hermes in doing everything in 15 ml, though, I’d own all the Monocles, plus quite a few more from the regular line. Same here. I love the Hermes model. PS, Luca Turin said that about something else, not White…..but I can’t find the review where he did say that….sorry! Thanks!! I forgot Artek altogether. I owned and loved Kyoto but it had no lasting power. It is 100% dead on for Japanese byakudon though, the sandalwood incense chips used in various rituals. I’d suggest the eponymous Comme des Garcons (Puig) as well as Wisteria Hysteria and Jaisalmer. These are the ones I like the most, and I love the Wisteria Hysteria bottle with the veil. The Stephen Jones bottles are lovely, and perfect fit. Vettiveru from the Cologne series is one of my all-time favorite scents. I also love Avignon, but I didn’t like anything else from the Incense series. CdG 2 is pretty wonderful. CdG has a pretty high batting average for me – I hope I can sample many more. The Monocle series seems really interesting. Oh, I liked Vettiveru too. Can’t remember if the Cologne series is in production or not at the moment. I’m realizing how many of the CdG perfumes I haven’t tried. The only one I own is Kyoto, and I have tried the other incenses. I’ve tried Stephen Jones (which I need to revisit because I know my feelings on violet have changed since I last smelled it), and I remember liking Daphne. But I haven’t tried anything from the other series. I’ve never smelled live osmanthus on the tree, though I’d like to. I have a big jar of dried osmanthus flowers that I picked up at an Asian grocery store that I frequent. Sometimes I like to open it just to smell it. The dried flowers smell a lot like dried apricots with a little bitter edge. And I’ve gone through several tins of osmanthus tea…which is probably what they sell the dried petals for? Not sure, but I’ve bought them too. I bought Dot for the bottle and was very disappointed it will not stand upright. It is sitting in a glass candle holder now. The smell was floral metallic on me. My favorite CdG scents are Black, Zagorsk, Artek Standard and Monocle Hinoki. Ack, it really is a reject bottle! I have the entire CdG Incense series and wear all of them. I also own their Blue Incense, Green and Black.